Dave Ramirez of Riverview, standing, and summer staff worker Michael Pettys and Tanner Cobb, 13, help new castnetters Matthew Martinez, 11, of Apollo Beach and Marty Haas of Riverview sort through the bait they caught. The netting lessons are part of a Fishing Camp being held all summer at E. G. Simmons Park. It isn’t every day that students on summer vacation get to meet and learn from experts about something that’s as much fun as the outdoors. So many teens signed up for the Guy Harvey Saltwater Fishing Camp sessions provided by Hillsborough County’s Parks, Recreation and Conservation Department that each of the eight two-week summer programs at E. G. Simmons Park in Ruskin is filled with 40 campers, the maximum allowed. 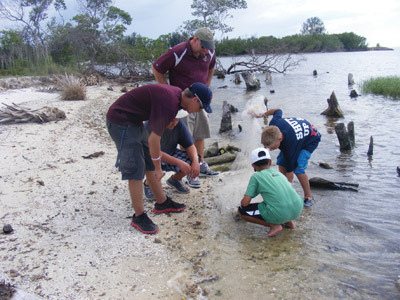 The program was provided through a partnership between the Parks Department and the Florida Youth Conservation Centers Network. “It’s a real Fishing 101,” said Dave Ramirez, area recreation program supervisor. “The first day we had them go over a lot of material,” he said, pointing to a table full of books, pamphlets and fliers explaining everything from licensing to bait. 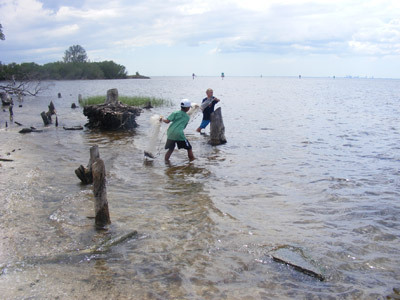 Audubon members will teach the campers about safety while untangling birds caught in nets or debris and discuss many other things about birds found in and around freshwater and saltwater. Many local fishing guides are helping too, including Mike Anderson from the Reel Animals television show, and C.A. Richardson, who has a television show and blog and is known for teaching classes worldwide. But fishing isn’t the only activity at the camp. 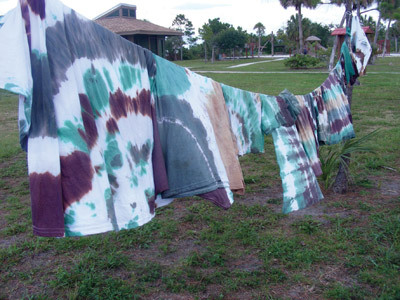 Last week the campers spent some time tie-dyeing camouflage T-shirts and swimming — until a storm began to roll in. Ramirez said their rule is: If it’s threatening within a 10-mile area, they must get out of the water. Field trips also are planned. One will be to Weedon Island State Preserve in Pinellas County where the campers will walk a four-mile stretch of Florida’s Green Trail. In another camping experience, Heather Cobb, a coach at Gardenville Recreation Center in Gibsonton, will supervise teens learning to master all the skills needed for camping, including pitching a tent, starting a fire, roasting hot dogs on sticks they gather, cooking beans on a propane gas grill, and yes, making s’mores. “They’ll even have a scavenger hunt where they’ll learn to use a compass,” Cobb said. They’ll go in groups of 40, she said, then be divided into smaller groups of 10. Combining learning with fun, Ramirez has set up time for Ducks Unlimited representatives to visit the campers and talk about hunting and conservation, and for some local divers and spear fishermen to explain safe diving and spearfishing. “We have a wide variety of activity to keep everyone busy all the time,” he said. Each session will last for two weeks, and all sessions will provide the same activities for campers so that all attending will receive the same opportunities for experience. To learn more about programs provided by the Parks Department, visit www.hillsboroughcounty.org/index.aspx?nid=99. For information about C.A. Richardson’s television shows or to view his blog, visit www.captaincarichardson.com. More about the Guy Harvey Foundation that helped provide the money for the camp may be found at www.guyharvey.com/our-mission. Heather Cobb, recreation specialist for the Parks, Recreation and Conservation Department, helped campers learn to tie-dye camouflage shirts between fishing and swimming May 18. Below, Marty Haas and Matthew Martinez have good throwing arms and can spread their nets wide.